In Hellas Planitia dust storm events usually occur during the southern hemisphere summer, when the solar insolation is the most intense. The high temperatures cause atmospheric convection, and thus wind currents. However, the observed dust storm appeared during the southern winter (Ls = 134°). The reason is related to relatively small size as local events occur at this location during the whole Martian year. Despite its low density, the atmosphere of Mars is able to move particles up to ~1µm in size via suspension (Read and Lewis, 2004). This is particularly the case in Hellas Planitia where the air pressure reaches up to 11 mbar due to its low elevation. This relatively higher atmospheric density lowers the wind friction speed threshold for lifting particles. This dust storm from July 2012 seems to originate at an east-west orientated wrinkle ridge not higher than 150 meters (see white area at the bottom of Image. 1). Its dark and dusty clouds evolve directly adjacent to the equator-facing slopes of that ridge and extend up to 220 kilometers to the north. Older images show no differences between both sides of the wrinkle ridge. Thus, the origin of the dark material remains unclear. Considering the lower part of the image (the first 80 kilometers northward) the appearance of the dusty clouds resembles longitudinal dunes. The upwelling cloud bands appear to be brighter than the intermediate areas. On average, both the bright and dark bands are 750 meters wide. They are probably caused by helical wind currents coming from the southern slopes of Hellas and appear similar to terrestrial horizontal convective rolls. The latter occur when convection meets downwind caused by cold air outbreaks (Etling and Brown, 1992). This process “stretches” the convectional vertices into extensive bands. Moreover, the significant length of the bands is evidence for laminar currents. Apparently, the wind speeds seems to be the highest at the crest of the wrinkle ridge, where the air masses converge, and thus, get accelerated. This acceleration exceeds a critical threshold of shear velocity, causing the lifting of dust from the surface by suspension. In-situ examination of the Mars Exploration Rover Spirit has shown that the Martian dust is extremely fine-grained but aggregated in sand-sized agglomerates. As these agglomerates have a lower density than sand they can be moved even by the tenuous Martian atmosphere during storm events (Sullivan et al., 2008a; SullivanN et al., 2008b). In the middle of the image, after about 80 kilometers, the bands get more diffuse and blend into shredded clouds. Wind velocities have decreased but convection still remains active, resulting in disappearance of the cloud bands. At this point, the dust cloud has gotten a thermodynamic of its own (Read and Lewis, 2004). The wide and high clouds are able to influence the temperature within its dusty body. Due to the low thermal inertia of dust, the high proportion of dust particles suspended in the atmosphere causes an isolating effect, preventing the dust storm from cooling at night. Hence, it can remain active for longer periods. Image 2: This image has been taken 11 days after Fig. 1 by ESA’s HRSC-Camera. The helical convection rolls have vanished and are now Cirro-Cumulus-like clouds (HRSC image a872_0000). Image credit: ESA, DLR, FU Berlin. 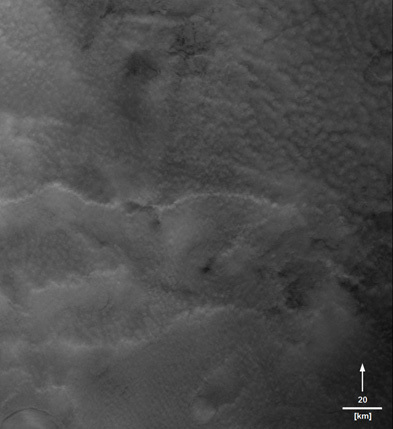 Eleven days later, the High Resolution Stereo Camera (HRSC) onboard the European spacecraft Mars Express has taken a second image in this region and found it covered in clouds similar to Cirro-Cumulus. It shows that the atmospheric turbulence has calmed but was still active. Moreover, the cloud cover has spread further north covering the entire northeastern Hellas and its adjacent surroundings. Since then, no new high-resolution observations have been taken of that region. It is likely that the source of the wind was located further south, likely on the southern slopes of Hellas Planitia where it blends into the old highlands of Malea Planum and Promethei Terra. This region is known for its strong winds draining down from the south polar plains into the Hellas Basin. During the southern summer they often cause regional sandstorms in this basin, and sometimes they can grow to global sandstorms, covering the entire surface of the planet (Wang and Richardson, 2013). So Hellas Planitia can be considered to be a significant weather machine on Mars. ETLING, D., BROWN, R. A. (1992): Roll Vortices in the Planetary Boundary Layer: A Review, Boundary Layer Morphology 65, p. 215 – 248. READ, P. L., LEWIS, S. R. (2004): The Martian Climate Revisited – Atmosphere and Environment of a Desert Planet, Oxford, 326 p.
SULLIVAN, R., ARVIDSON, R., BELL, J.F., GELLERT, R., GOLOMBEK, M., GREELEY, R., HERKENHOFF, K., JOHNSON, J., THOMPSON, S., WHELLEY, P., WRAY, J. (2008a): Wind-driven particle mobility on Mars: Insights from Mars Exploration Rover observations at “El Dorado” and surroundings at Gusev Crater. Journal of Geophysical Research (Planets) 113, Issue E6, 10.1029/2008JE003101. SULLIVAN, R., ARVIDSON, R.E., BELL, J.F., GOLOMBEK, M., GUINNESS, E.A., GREELEY, R., HERKENHOFF, K.E., JOHNSON, J.R., SQUYRES, S.W., THOMPSON, S., WHELLEY, P., WRAY, J. (2008b): Wind-driven Particle Mobility on Mars: Insights from MER Observations at “El Dorado” and Surroundings at Gusev Crater, LPSC XXXIX, p. 2092. WANG, H., RICHARDSON, M. I. (2013): The origin, evolution, and trajectory of large dust storms on Mars during Mars years 24–30 (1999–2011), Icarus, http://dx.doi.org/10.1016/j.icarus.2013.10.033.